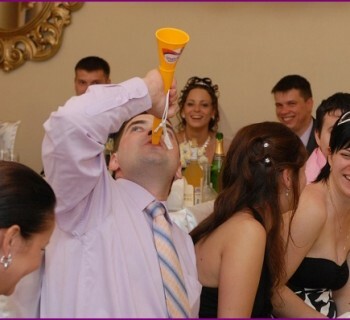 It's hard to imagine a wedding without a merryexciting, dynamic and fun games. 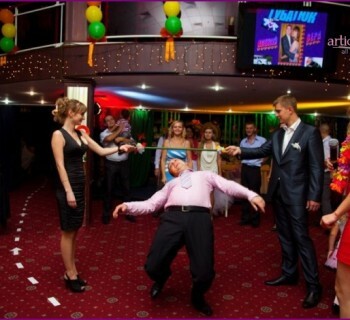 To cheer up the guests invited to the wedding of vigorous competition on alcoholic relay. He will bring a lot of positive emotions, genuine laughter of the public, and most importantly - will help diversify this wonderful holiday, use the most shy and indecisive guests. The following participants are poured again, drink, run. The contest continues until such time as onethe teams will not empty the bottle. The winners are those who managed to drink the first bottle to the bottom. Included cheerful music, all seated on their seats, the team is awarded incentive prizes, and one of the winners are invited to the table to make a toast to the newlyweds. This game will cheer, cheer not only the participants, but also the spectators. In this relay race involving the two teams. No strict rules regarding the number of participants, but it is suggested that an odd number. If the main drink vodka is selected, then the competition is desirable to select stable men. Female participants is ideal for wine and champagne. The average number of participants in each team - seven people. According to the script, it is desirable to use the batonat the beginning of the celebration until the guests did not have time to drink a lot, I feel full, that is, cheerful feel. Also, in the absence of the photographer is to prepare the camera, which make a lot of funny, funny pictures, and video is also possible. The role perfectly perform small gifts souvenirs: key chains, figurines, pens. Master of ceremonies prepares beforehand gifts, stipulatingthem with the bride and groom. 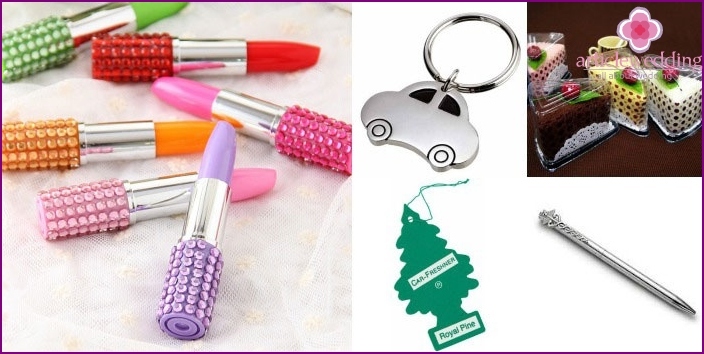 Women can purchase small accessories - pins, beautiful sets of rubber bands for hair, stylish pens, notebooks, and men - key rings, badges, air fresheners for the car. It is important to pay attention to everyone, even the losing team also received prizes for participating - candies, chocolates and other goodies.